By February 2012, occupancy at Pennswood Village, a welcoming, Quaker-based continuing care retirement community in Newtown, Pennsylvania, had dipped to 88 percent, and the unoccupied residences represented about $5 million in unrealized entrance fees and about $1.1 million in unrealized annualized monthly service fees. As a result, Pennswood leadership recognized that the community needed to change its approach, and chose Love & Company to help it get back on track. As part of that plan, Love & Company launched a integrated media strategy 2014 that included blog and enewsletter strategy and execution. After a little more than 2 years of consistent application of Love & Company’s recommended strategy had passed, it was time to take a look at these longer-term, lead nurturing tactics and determine the return on investment. 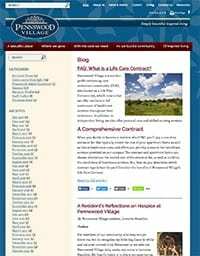 Love & Company’s PR and Integrated Media team began working with Pennswood Village in 2014 – the first enewsletter was sent in November of that year. 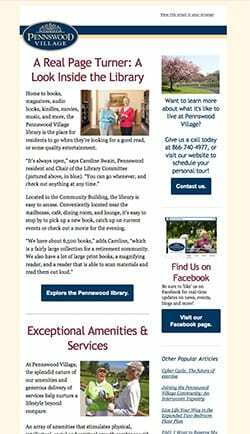 After each enewsletter, Pennswood Village received proprietary reporting that allowed the sales team to customize follow ups with members of the enewsletter list. Additional monthly reporting helped highlight prospects who were interested, but were at risk of being lost leaded because they were not willing to accept phone calls from the Pennswood Village team. To look beyond open rates and click rates, and to truly show the ROI, we pulled a report of all of the new move-ins that occurred between November 2014 and April 2017. We looked at their initial inquiry date, move in date, and whether or not they received the enewsletter. Would there be a difference between people who received the blog content via enewsletter and those who did not receive the enewsletter? We found that of the 78 move ins in that timeframe, 8 were receiving the enewsletter. The average number of days between initial inquiry and move in for prospects who did not receive the enewsletter was 1084. For prospects who did receive the enewsletter, the average number of days between initial inquiry and move in was 612. The difference in average number of days between initial inquiry and move in is 472 days. People who received the enewsletter moved in just about 16 months sooner than their counterparts who did not get the enewsletter. How much of a financial difference does 16 months make? To find out, we determined the weighted monthly service fee (the monthly service fee for each unit type multiplied by the percentage of overall inventory, then added together). Pennswood Village’s weighted monthly service fee is $5,062. Next, we multiplied $5,062 by 12, then divided that by 365 days to get a weighted daily service fee of $166. We took the difference in average days to move in (472) and multiplied it by the daily service fee. Moving in 472 days sooner results in $78,564 in additional revenue. Multiplied by the 8 move ins, Pennswood Village’s PR and integrated media efforts contributed to $628,517 in additional revenue, a 314.24% return on investment. Long-term, consistent application of digital nurturing tactics resulted in a 314% ROI for Pennswood and contributed to more than $625,000 in additional revenue.